"Amir Molookpour began to study the traditional Persian music at the age of nine. After some years he began to study the Western music as an autodidact and since 1994 followed specialization classes with Hassan Riahi, The composer of the last Iranian National Anthem.Since 1995 he began to collaborate with the symphony orchestra of the Iranian radio and television as a composer and arranger, writing several pieces for symphonic and chamber orchestra, including a Fantasy for Tar and Orchestra and the Short Suite for small orchestra, which was elected as one of the best composition of the Iranian National Radio in 1999. He was one of the first members and co-founders of the Association of Young Iranians Composers who has had a considerable success at national level. 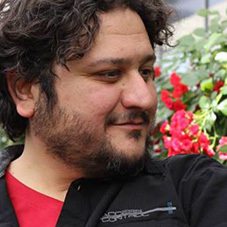 In 2001 Molookpour moved to Italy to study Musicology at the University of Pavia (in Cremona) continuing to work with the Symphony Orchestra of the Iranian Radio as a composer. He did researches on the role and functions of music in the religious rituals of the Zoroastrians of Iran, which later became the subject of his thesis in the Faculty of Musicology in Cremona. In addition, for several years he collaborated with newspapers and musical magazines in Iran writing regularly on musicological and socio-cultural issues. At the same time he continued to compose several pieces, including a string quartet, Three Lieder on poems of Hermann Hesse (performed during the event ""Spazio '900 in 2009), a Requiem on Latin and Persian texts and numerous compositions for solo instruments such as piano, clarinet, cello, etc..."